Indian player Ishika Shah won back to back two matches on the first day of World Open Under-18 Women Snooker Championship here at Beijing. The morning session match she played against Aleksandra Bogatyreva of Russia and defeated her in straight set of frames 2-nil. Though Aleksandra had chances in both the frames but failed to convert them in win. 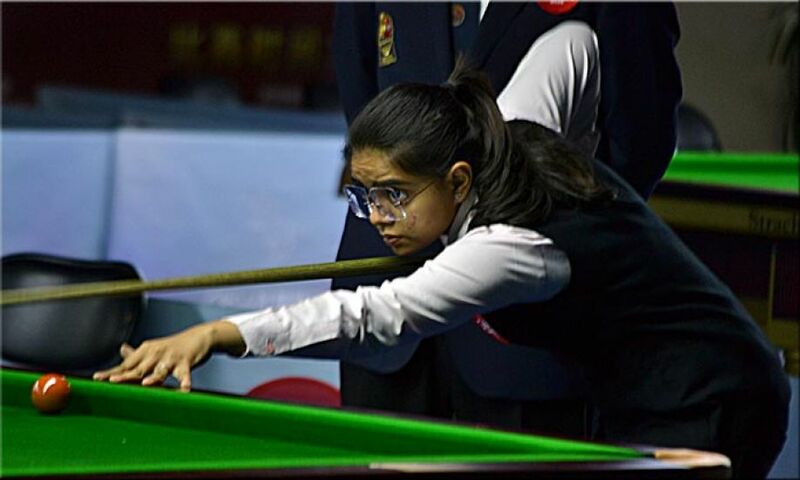 On the other-side, Ishika kept scoring at regular intervals to win both the frames 72-35 and 40-26. In second match Ishika faced good competition against her compatriot Keerthana Pandian, but in the end she won 2-1. Despite having tough fight, Ishika managed to take lead 1-0. Though she couldn’t save the next frame that she lost 08-44, but again in decider frame she controlled it her way and won 2-1. Thai player Nutcharat Wongharuthai scored break of 58 while playing Alexandra Riabinina of Russia. This break is now the highest break so far in this championship. In Boys category, Florian Nüßle of Austria outclassed Ivan Kakovsky of Russia 3-1. Florian was in good form and posted two breaks of 75 and 55 in first two frames to take 2-nil lead. After that Ivan pulled up one frame on black ball to narrow down the deficit. He gave good fight in next frame too but Florian managed to win the frame by 11 points and close the proceedings.